Vidhi Centre for Legal Policy and Oxford University Press extends an invitation for the launch of their book, ‘Appointment of Judges to the Supreme Court of India: Transparency, Accountability, and Independence’. The event is on the 9th of April at 6:00 pm at the Multipurpose Hall, India International Centre, New Delhi. The book is edited by Ritwika Sharma and Arghya Sengupta. This is an edited volume of essays, commissioned by the Oxford University Press, which will serve as the first port-of-call for any scholar, researcher or lawyer, to understand the politically critical subject of judicial appointments in India. 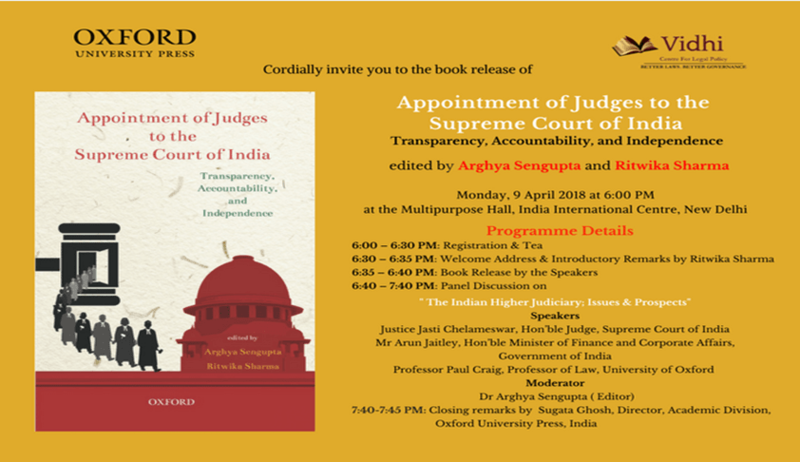 This book uses the Indian Supreme Court’s judgment in the seminal National Judicial Appointments Commission case as a springboard to address the politics, doctrine and developments pertaining to judicial appointments in India. In doing so, it fills a gulf in legal scholarship in a subject area that is increasingly central to public debates in India and abroad. With 21 essays across three parts written by leading lawyers, including Arun Jaitley, Arvind Datar and the late Tehmtan Andhyarujina, political scientists, including Pratap Bhanu Mehta, and legal academics from India and abroad, including Peter McCormick and RehanAbeyratne, it is a deep dive into the constitutional concepts of judicial independence and separation of powers. The release of the book will be followed by a panel discussion on ‘The Indian Higher Judiciary: Issues & Prospects’. Justice Jasti Chelameswar (Hon’ble Judge, Supreme Court of India), Arun Jaitley (Hon’ble Minister for Finance and Corporate Affairs, Government of India), and Professor Paul Craig (Professor of Law, University of Oxford, UK) are the speakers. A detailed agenda for the event can be found here.